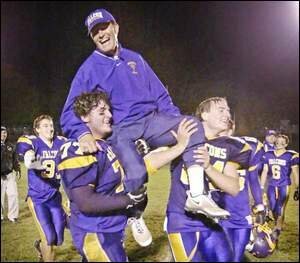 In 25 years of excellence at Sheboygan Falls High School, Dan Juedes never coached a varsity football team to a losing record. His perennially well-prepared, fundamentally sound program captured 12 conference titles and made the playoffs 19 times. His undefeated 2000 team won the WIAA Division 3 state championship. Friday, Juedes confirmed that he is retiring as head coach of the highly successful Falcons' program. He told his players Wednesday, and will submit the official paperwork on Monday. "It was a tough decision, because I love this program, and it's been such a huge part of my life," Juedes said. "But the biggest thing is, I don't feel I can do justice to this program as a head coach, while at the same time being a dad." Juedes, 54, said he's stepping aside so he can spend future fall weekends watching his two oldest sons' college football teams play. Dieter will be a redshirt junior quarterback at UW-Oshkosh, and Jacob will likely redshirt his freshman season at the University of Nebraska-Omaha. Though Jacob likely will not play this upcoming season, Dan Juedes said he, wife Shelley and youngest son Bryce plan a few trips to Omaha to soak up the gameday atmosphere. "That's 99.9 percent of what's behind this," Dan Juedes said of his planned trips to Oshkosh and Omaha. "If my boys weren't playing college football, I wouldn't (be retiring). We need to get out and see some games." Juedes, a member of the Wisconsin Football Coaches Association Hall of Fame, retires with a career record of 206-60. According to the WFCA Web site, his number of wins is tied for 33rd all-time in state history. "What an outstanding coach," said Jim Beaver, head coach at Plymouth from 1979-1995 and current offensive coordinator for the Panthers. "We had a great rivalry. His teams were always superbly prepared for every situation. His kids were always so emotionally ready to play, and he got every ounce of talent out of his teams." Beaver, who went 104-54 in his stellar career as a head coach, said with a chuckle that he always tried to start prepping for Falls two weeks before the annual matchup between the Eastern Wisconsin Conference powers. "I knew they'd have us scouted so well, and you just didn't find weaknesses when you looked at them. Most teams, you find some loopholes. His were so well prepared. He must have watched hours and hours of film. We just had some great, great battles. What a worthy adversary." Dan Juedes said he'd like to stay on as an assistant coach at Falls, possibly serving as a freshman or junior varsity coach. He stressed that he will gladly serve his successor from the background, realizing "there can be only one boss. I will offer whatever is wanted and needed." There is no successor in line, Juedes said, adding that the school will likely launch a state-wide search. "They should advertise the position," he said. "I want them to draw a high-quality individual. I think it's going to be a great program. We've got four practice fields, a good varsity field and as good a weight room as there is in the state. I do think we need to make some improvement in our feeder program, and I hope our youth program is ready to embrace some change." As Dan Juedes prepares to embrace change in his life, he knows he'll miss orchestrating the X's and O's, running the long Sunday afternoon film breakdowns with his staff and of course, the many wins his dogged preparation helped yield. But what he'll miss the most, he said, are the people he's met. People like former player Pat Grusznski, a 143-pound starting center on Juedes' first team at Falls (1982) who is now the head junior varsity coach at Sheboygan North. "He appreciated the hard workers," Grusznski said. "And as a coach, he had a way of taking the basics and really polishing them up. He also built confidence. Usually for us, it wasn't whether we were going to win, but by how much. "The other thing about him is, he's a lot funnier than people might realize. He made the game fun. He understood that it can be serious, but still fun." Coaching the game was both for the demanding, hard-working man who always put a winning product on the field. "You look back, and 25 years as a head coach sure went by fast," Juedes said. "The highlight is the relationships you form with players and the great coaching friendships you establish all over the state. It's that dedication, the sweat and tears you share with your teams, that means the most. I have been very lucky." A great coach & a class act! Thanks for the memories. Friday night will never be the same. Contact us at 920-457-7711. sheboygan-press.com is a Gannett Company website.